Last year Australia’s Steve Brewin won his second A-Class Catamaran world title, besting a field of 96 competitors to secure the top spot at the 2011 A-Class Catamaran World Championship in Aarhus, Denmark. 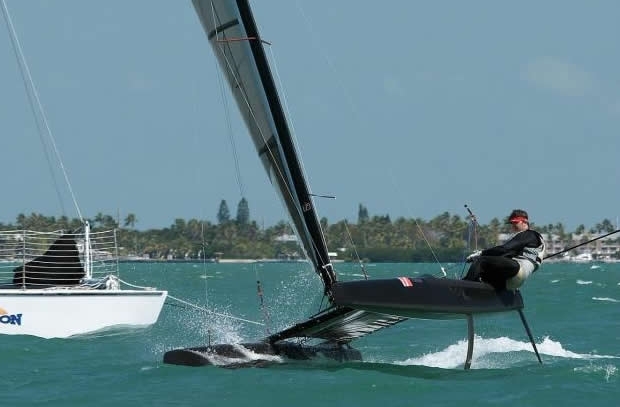 This October he looks to defend his title when the A-Cat fleet arrives in Islamorada, Florida for the 2012 Ronstan A-Class Catamaran World Championship. However while Brewin will be looking to hold off the competition, a repeat performance will be anything but easy this time around, against a fleet of well over 100 top sailors all set to do battle in the Florida Keys, when the regatta kicks off on 20 October. The event, headquartered at Islamorada’s Islander Resort, a beachside vacation spot and site of the 2007 Worlds, runs over 20-26 October, the races taking place on the Atlantic side of the Keys, inside the barrier reef and right in the middle of the north east trade winds. Yet while the trades are typically some of the most consistent breezes in the world, conditions in Islamorada have previously been anything but consistent, with fronts often coming through and shifting the breeze to an offshore northwest direction and further upping the difficulty level. Luckily the event features some of the best sailors from around the globe, and the variable conditions simply add another element to what is sure to be an intense competition. The obvious favorite coming into the event is Brewin. The current Champion is coming off his second Worlds’ victory, having first taken home the gold with a win at the 2001 Worlds in Castelldefels, Spain. However Brewin is likely to face stiff challenges even from his own countrymen. While Scott Anderson, Brewin’s main competition from 2011, will not be attending, fellow Aussies Andrew 'Landy' Landenberger, Jack Benson and Brad Collet all figure to be serious threats. After all Landenberger, of Landenberger Sails, finished just off the podium in 2011, placing fourth, and is fresh off a win at the 2012 A-Class European Championships where he got the better of current European Champion Chris Fields. Meanwhile Benson and Collett finished third and fifth respectively in 2011 and both are likely to be forces once again in 2012. However Australia is not the only nation vying for the championship. The United States has also thrown its hat into contention with Lars Guck and Matt Struble both expected to be well in amongst the top boats. While each finished in the 20s in Aarhus (Guck 29th, Struble 24th) Guck, the former Tornado Olympian, finished second to Glen Ashby at the previous Islamorada World Championships held in 2007, and has already won the North American Championships three times. Meanwhile Struble took home the 2010 North American Championships, the last event he and Guck sailed against each other prior to the 2011 Worlds, and has dominated international iceboating for the better part of decade, winning six Detroit News World Championships in the past six years. Other notable entrants include 2011 Australian of the Year Simon McKeon of Macquarie Innovations, Jay Glaser of Glaser Sails, and Ben Moon of Ronstan, who finished 7th in 2011 one point behind Spain’s Manuel Calavia. However while many of these 'old faces' have fought it out on the World stage many times before, a number of new entrants into the class have given the event the definite feel that it is anybody’s regatta. The American fleet has recently received an infusion of new blood from Moth sailor Brad Funk and Star Class Olympian Mark Mendelblatt, both of whom are expected to be significant players. Meanwhile the United Kingdom, a market previously untapped by the A-Cat, figures to mount a serious challenge from either current European Champion Fields or Abu Dhabi Ocean Racing Watch Leader Rob Greenhalgh. New Zealand also figures to get into the mix, with Oracle Racing’s Mike Drummond coming off a 9th place finish in Aarhus, just ahead of Germany’s Bob Baier, who also will likely be at the top of the fleet. The event, sponsored by Ronstan, FSE Robline, HallSpars, Zhik, Glazer Sails, Liquified Creative, BlueStreak BoatWerks, Hullspeed.us and KO Sailing, officially opens on 19 October with registration and measurement. The skippers’ meeting and practice races are scheduled for the 21st with racing in earnest starting on the 22nd. The planned nine races will take place from the 22nd to the 26th with the 27th reserved as a weather date.